Enough ramblings, lets get started. Here is how the app will look like. Immediately upon startup, you will see a small ball moving around randomly. Let's plan our code according to what we want to do with the app. 1. We want a ball - so we need a UIImageView AND a ball image. 2. We want it to move around - so we need to figure out how the ball is going to move, and to which location. This will involve a little Maths. Secondly, let's declare a method to move the ball. Now we have these two things set up, we can now able to reference the ball so that we can change its coordinate, via the method. Before we go on to write the code in the main file (.m file), it is better we connect the ball (ie, myball) to the corresponding UIImageView in Interface Builder. Im assuming you already know how to do that, so just connect it to the File's Owner and you select the myball label appeared in the list. 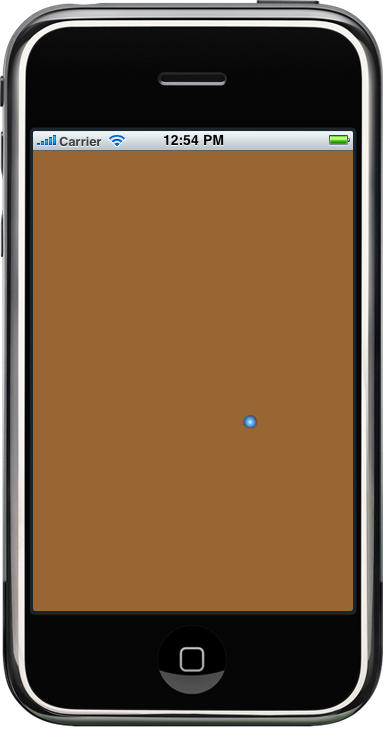 Once it is connected, you can add a ball image to your resource folder. This image can be any name, but preferably of type PNG. Adding the image to your project is very easy - you just drag the image from Finder into the XCode left pane under "Resources" folder. A confirmation box will pop up and you just click Add. Once you added the image to your project, you need to display it in the UIImageView that you just placed in IB. So, in IB, select the UIImageView and goto the first tab (with a slider icon on it), and select your image from the drop down list of Image. That's all for setting up the interface side! Then, we need a global variable to store the coordinates of the ball, as follows (put this under @synthesize is good). 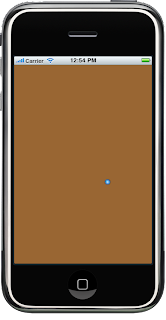 Note: Something about the iPhone screen/display: In portrait mode, its size is 320pixel wide and 480pixel high. A coordinate of 0,0 is at the top left hand corner (origin). 1. set x-coordinate to be a random position between 0 and 319 horizontally. 2. set y-coordinate to be a random position between 0 and 479 vertically. 3. call the movetheball method (custom method that we need to write). 2. do animation movement on it within 1 second period. I comment the method's code for the description. // tell the app we are making animation. The name MovingTheBallAround is arbitrary. // set the delegate to self - otherwise the delegate method wont be called! // this line set the animation length in seconds. // this line specify the type of animation. EaseInOut, EaseIn, EaseOut and Linear are the options. // try to change it and see the effect. // imageview and XCode will do the rest. It is that simple. // In this case, we are setting coordinates of the image to ballx and bally. Next, since we want the ball to move forever, we need to move the ball again after it has finished the movement/translation. So, how do we know when the ball has finished moving? Here comes the animationdidStop DELEGATE method. Delegate method is something like a public method for a certain actions - in this case for the animation action. Whenever any animation stop, this method will be called. All you need to do is handle the messages the app sent to it. So in the delegate method, we need to re-set the ball coordinate to another random value and then, call the movetheball method again to animate it to a new position. Do note that delegate methods' name are pretty much fixed. You must write the name as it is, in this case animationDidStop. Do not spell it wrongly (which is a common mistake among new coders). Play around with the values and see what happens. Thanks, this worked great. I later tried to use your concept for a rotation animation ( a tail wagging) but it crashed on animationDidStop. Is there something different about rotation? I appreciate any guidance you can give. I've tried and everything works except for the @synthesize redsquare; It gives me the follow error:missing context for property implementation declaration. @murder_princess, did you declare @property for the redsquare in .h file?